In our previous post we looked at what Fascia is and at one of the most common conditions associated with it, Plantar Fasciitis. 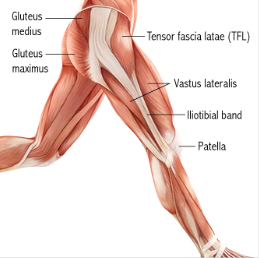 Following on from that topic, another common and painful condition associated with fascia is Iliotibial band syndrome or ITB Syndrome. ITB syndrome or ITB friction syndrome is a chronic injury that causes pain on the outer aspect of the knee. The Iliotibial band is a thick fibrous layer of connective tissue that lies on the lateral aspect of the thigh. It attaches at the Iliac crest of the pelvis and runs down the lateral aspect of the thigh, crosses over the knee joint and attaches to the top of the Tibia in the lower leg. The ITB helps stabilize the outer part of the knee and it helps with both knee flexion and extension. When the knee joint is flexed, the ITB is located behind the femoral epicondyle. This is a bony protuberance of the femur or thighbone. When the knee gets extended the ITB moves forward and across the epicondyle. In order for this action to occur smoothly there is a sac of fluid known as a bursa between the ITB and the bone. The problem comes in when there is increase friction and stress placed on this area. With repeated stress and strain the ITB can become inflamed and rubs on the bursa and bone. This then cause pain on the lateral or outer aspect of the knee joint. In simple terms ITB syndrome is caused by repetitive bending and stretching of the knee during running, swimming, climbing and other activities. Symptoms typically start a short while into exercise and get progressively worse as exercise is continued. Ensuring the correct biomechanics while running is essential. It is also important to check the camber of the road that you are running on as repetitively running on the same camber can lead to ITB pain. This is because more pressure is placed on the one leg. For more information about ITB Syndrome and how to treat this painful condition don’t hesitate to contact us for a full assessment. This entry was posted on Monday, October 1st, 2018 at 12:49 pm and is filed under In Session. You can follow any responses to this entry through the RSS 2.0 feed. Both comments and pings are currently closed.